this group is all about InuKag!!!!!! so if u dont like that awesomely awesome couple u have two options..
now if u so happen to happen to just plain go googoo over this couple then u r in the right place no matter wat ur mother may tell u! group icon by Cati-Art whose page u definatly have ta check out! 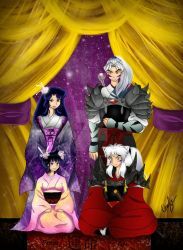 okay im tryin to find this story i read that was an inukag story...i cant remember if it was here or on fanfiction but i cant seem to find it...it was a story where some whitch or demoness finds inuyasha and he and all his friends has to take this test where they dont know each other and that kikyo and kagome are sister priestess and inuyasha is a little kid and kagome is the one who protects inuyasha from kikyo....has anybody read that story? Hi, princess-sweetflower here~! I have a plot for roleplaying Inuyasha. 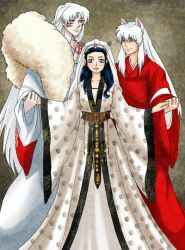 I was wondering if you (meaning anyond who reads this) would like to RolePlay Inuyasha with me? I want to pair Kagome up with Sesshomaru and Inuyasha father (which is Toga, I looked it up several times just to be on the safe side). My oc will Serena and she will be found as baby in a forest. It will take place when Naraku is in hiding at mt hakura when the band of seven was revived. Sesshomaru will be joining Inuyasha's group. A friend of my told me to always ask that.